In 2015 we were contacted by Donna Frank, Dr. Frank’s wife and managing partner. She was interested in Search Engine Optimization (SEO). “I was weary about SEO and had never tried it, but I decided to give it a try,” says Donna. Since she was introduced to us by her dental consultant, Janice Hurley, she decided to sign up. First, a little background. 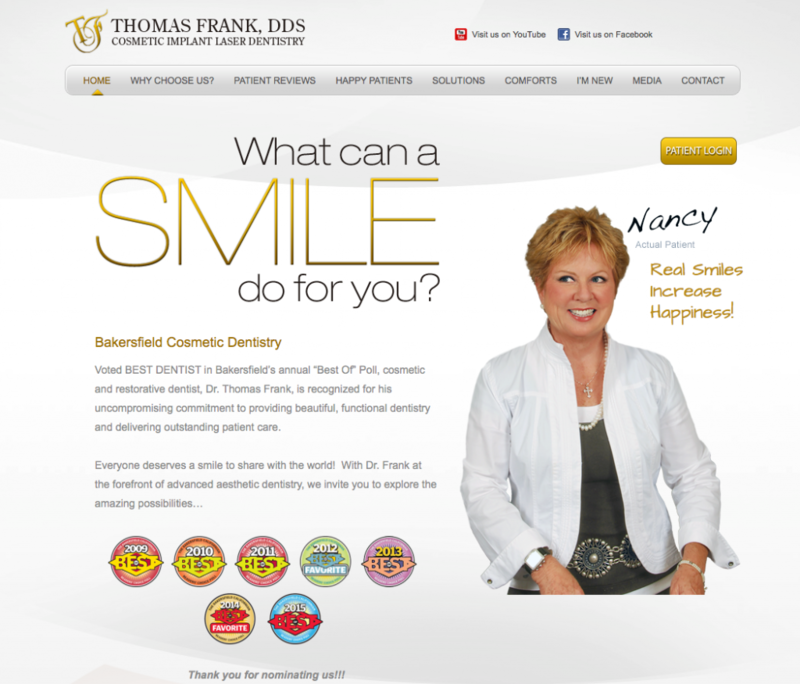 The Bakersfield area, where Dr. Frank’s office resides, is saturated with cosmetic dentists. Due to this fact, I knew from the get-go that this campaign would take some time to bear fruit. 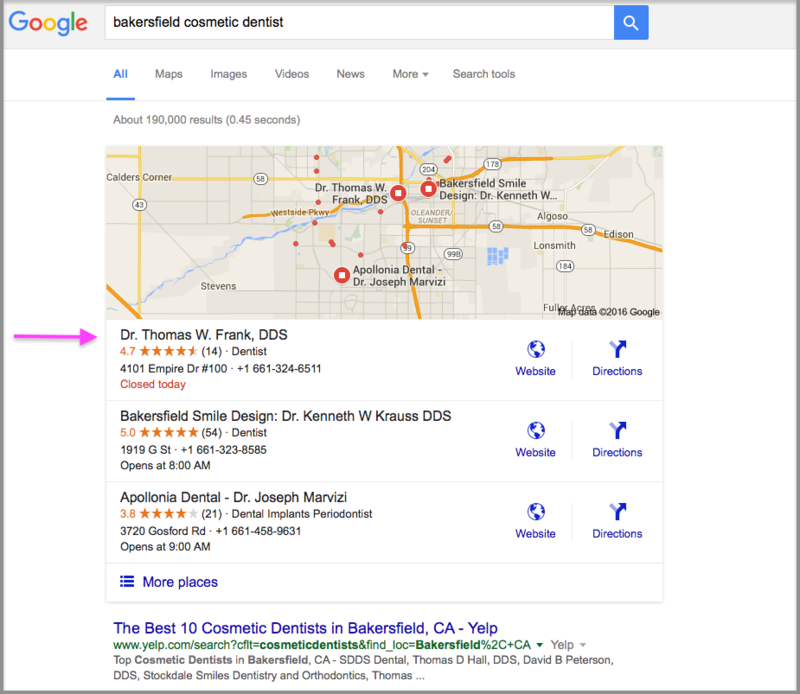 With hard work and cooperation from Donna and her team after about a year, we were able to rank the site to a whopping #1 spot on Google for Bakersfield Cosmetic Dentist and other related keywords. 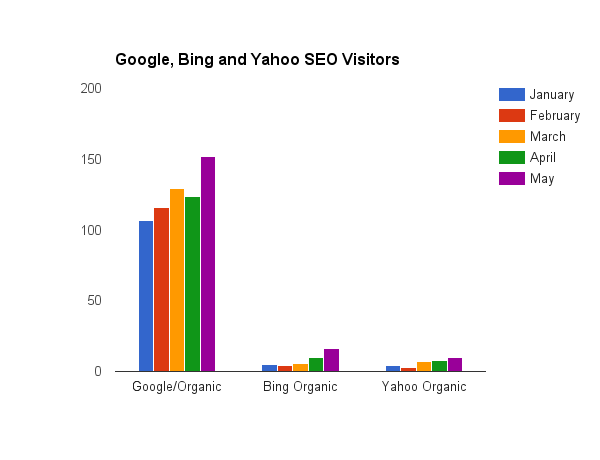 This, in turn, helped the site’s qualified traffic from Google to grow by 71%. “I never thought that in our competitive market, Ali and his team could place our site at #1 on Google for ‘Bakersfield Cosmetic Dentist’ or ‘Best Dentist in Bakersfield‘,” explains Donna. What made this campaign succeed? Here is an outline of what we did for Dr. Frank (some proprietary and sensitive information is omitted). By aiming at Google, our team was able to guarantee Dr. Frank’s success. As you can see from the graph above, Yahoo! and Bing only bring in a few visitors each month. We worked diligently over a period of several months to build out some of the most professional and up-to-date content for Dr. Frank’s site. We answered questions related to cosmetic dentistry and wrote periodic blog posts and optimized them for Google. Consequently, Google loves this site. Of course, everyone talks about site optimization. However, our team has learned what Google likes and dislikes over the years, and we used that knowledge to implement some incredibly effective techniques. From meta tags to placing keywords in the right places to optimizing the URL’s and increasing the site’s load speed, we left no SEO stone unturned. All of this and many other factors helped the site rank better. Our team had to verify Dr. Frank’s local results with Google. We also registered his practice with relevant local directory sites. Combined with #5, the results were a #1 spot on Google Maps. Dr. Frank is a great dentist; therefore, his patients are happy to leave him positive reviews. The ones published on Google (Google Reviews) help the site rank better in the search results. Dr. Frank’s case definitely belongs in the spotlight. If SEO is implemented correctly, a client will see a significant increase in income from clients discovering their site on the Web. After all, we all search Google for what we’re looking for. And now, thanks to Donna for choosing us, Dr. Frank’s website is found on Google. This leaves the doctor satisfied, his practice constantly improving, and it makes our team at Millionairium pleased with another job well done. “I’m very happy we chose Millionairium and will suggest them to anyone interested in getting more patients from the Internet,” continues Donna Frank. If you have a site but it is not visible on Google, we can help. Give us a call at 3102992799 or fill out our form and one of our representatives will get in touch with you. 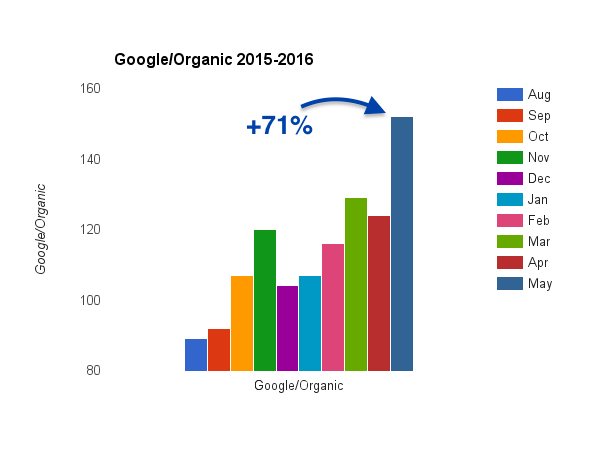 Organic and places rankings have gone up together and fast.